Almino, João. O diabrete angélico e o pavão: enredo e amor possíveis em Brás Cubas. Belo Horizonte: Editora UFMG, 2009. 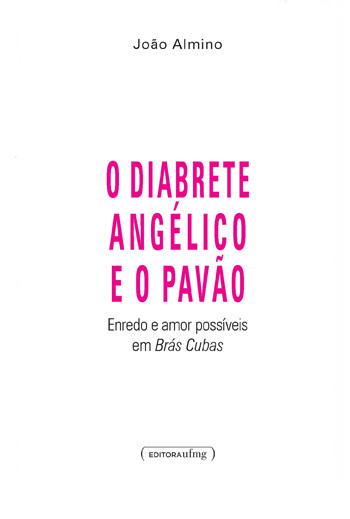 João Almino’s recently published book O diabrete angélico e o pavão: enredo e amor possíveis em Brás Cubas brings fresh air to the appreciation of Machado de Assis’s most studied, analysed, and scrutinised novel, Memórias póstumas de Brás Cubas. Almino’s starting assertion is Virgília’s central role in the novel, a centrality seldom (or indeed never) acknowledged by critics, both in Brazil and abroad. According to the essayist, the reader would benefit from focusing his or her attention not only on the main female character but also on the novel’s plot, a narrative feature consistently overlooked by critics as different from each other as Roberto Schwarz (Machado de Assis – um mestre na periferia do capitalismo, 1990) and Alfredo Bosi (Brás Cubas em três versões, 2006). Claiming to start from those aspects to which the narrator devotes more attention, João Almino calls his own method “a exposição do óbvio, se o óbvio fosse facilmente percebido como tal” (8). He seems to be aware, as Machadian close readers know only too well (Helder Macedo and Pedro Meira Monteiro are two excellent examples), that nothing in Machado de Assis’s novels is obvious, that everything which is can also, and at the same time, not be. To that extent, Almino’s discussion of Brás Cubas ends up being much more interesting than what is proposed at its outset. What I mean by this is that there are issues discussed in the book which seem to be there regardless of the method of “exposição do óbvio.” One of these issues is the discussion of references, first to Dante, explicit in the novel, then to Flaubert, absent in Memórias póstumas, but to whose Emma Bovary Almino compares Machado’s Virgília. The essayist’s comments about the presence of Dante’s Commedia in Brás Cubas stress the double (perhaps triple, quadruple, infinite…) entendre of a brilliant narrator, who tells the story of an almost entirely amoral couple, hardly ever haunted by remorse, which, as opposed to Paolo and Francesca, will never suffer any sort of punishment. As Almino observes, the author nods towards the “romantic” and the “tragic”—”Há piscadelas de olho para o romântico e o trágico” (36)—but never engages either in tragedy or in romanticism. Likewise, what the critic says about a verse of Dante’s Purgatory, which Machado applies to the Virgília- Brás couple (when, in fact, in the Italian masterpiece it refers not to a couple of lovers, but to the narrator himself and Oderisi, the vain, if gifted, artist who walks with the narrator from canto XI to the beginning of canto XII), indicates again Machado’s cunning use of reference: different layers of intertextual meaning, the less obvious here pointing not to the Brás-Virgília relationship but to Brás’s own vanity and love of glory. This less obvious meaning demands a hardworking, learned reader toward whom, again, Machado seems to nod and wink. Another fruitful connection is the one between Memórias póstumas and Madame Bovary. If both plots deal with adultery, the Brazilian critic claims – with good reason – that Machado de Assis’s Virgília is much more modern than Flaubert’s Emma, inasmuch as she is totally free from guilt, the tragic undertones of the French novel being replaced here by the banality involving the whole affair, which ends not with a bang, and not even with a whimper, but simply with the cessation of love between the lovers. In Almino’s words, the latter “deixam de se amar, sobretudo porque deixam de se amar” (37). Almino bases some of his analysis on statistical data. Virgília is central to the novel because her name is present in the narrative 198 times, as opposed, say, to Eugênia’s, which is only mentioned 14 times. Whilst not entirely convinced by this approach, I must concede that Almino’s emphasis on the love affair between Brás—”o pavão”—and Virgília—”o diabrete angélico”—and on the alleged consistency of the plot, rather than on the more obvious fragmentation of the narrative structure (a topic stressed by both sociological and philosophical interpretations, both in psychological analyses and in those focused on the so-called Shandean form), is refreshing to our understanding of a much-revisited novel.